All media must evolve to stay relevant in our lives. We’re seeing it now on four levels: news, communication, commerce and entertainment. The way we get our news is changing, from print to web and apps. We communicate and interact daily on Facebook and text messages. We shop online more than ever before. We’re entertained not by video-rental stores but by Netflix and Hulu. The radio dial we used to turn is now a digital dial. Shifts in consumer behavior force media to evolve. Today that shift is toward personalization. Pandora, the leading Internet radio service, is the evolution of FM radio. Its customized radio plays songs it knows we’ll like – it learns our tastes – using Pandora’s Music Genome Project. Editor’s Note: This article first appeared on StateCollege.com in Tech Talk, a biweekly column by Eric Zimmett. Click here to view the original column. Pandora announced Tuesday at the International CTIA Wireless 2012 conference in New Orleans that it has surpassed 150 million registered users, nearly 52 million of which are active listeners. It is now one of the most-used online services in the United States. In April, Pandora users clocked 1.06 billion listening hours, an 87 percent increase over the same time last year. Audience measurement and consumer research company The Media Audit revealed last week that Pandora is the No. 1 listened to station in Los Angeles, beating out KIIS-FM. The Media Audit found that Internet radio has reached 20 percent saturation; which means there’s still plenty of room to grow. Among 18 to 34 year olds, the saturation – or market presence – hits 36.6 percent. Pandora: Personalized Internet radio service that creates stations based on your favorite artists and songs. Pandora offers free and premium Pandora One, which features ad-free listening for about $3 per month. Sirius XM: Subscription satellite radio service starting at $14.49 per month featuring more than 140 channels including 71 commercial-free music channels plus news, talk, sports and more. You’ll need a Sirius or XM radio to use the service, unless you opt for an online-only subscription for about $13 per month. Sirius XM is also available in select vehicle models. Spotify: On-demand music. Enter an artist and play the tracks you want to hear. Spotify also features genre-specific stations and the new Playlist Radio. Free on desktop or laptop computers – but to play on mobile devices or tablets Spotify Premium ($9.99 per month) is required. Slacker: Slacker plays songs based on your favorite artists or tracks, in addition to genre-specific stations. Slacker has a free level and two premium options: Slacker Plus ($3.99 per month) and Slacker Premium ($9.99 per month), with Slacker Premium featuring on-demand music like Spotify. Songza: Songza sets itself apart with its Music Concierge featuring situation-based music, from Waking Up, to Unwinding After a Long Day, or even A Sweaty Dance Party. According to the annual Infinite Dial study released last month by Arbitron and Edison Research, weekly Internet radio listening jumped more than 30 percent in the past year. The study includes streaming AM and FM stations. Pandora listeners hit 22 percent of people 12 years and older who’ve listened in the past month, up from 16 percent last year, according to the same study. New car tech is catching up, too. Including “Infotainment” systems that connect to Internet radio services like Pandora and satellite radio service Sirius XM. Pandora is available in 48 vehicle models across 18 brands and an array of aftermarket multimedia systems. Cars with built-in iPod sync and audio jacks enable a driver to either wirelessly sync a device or plug it in, playing the audio through the car’s stereo system. More than 70 percent of Pandora’s listening hours were from a device other than the computer, the company announced Tuesday. This correlates with the growing number of mobile devices and users accessing the Internet – and Internet radio – away from the computer. In the past two years, smartphone ownership has tripled. 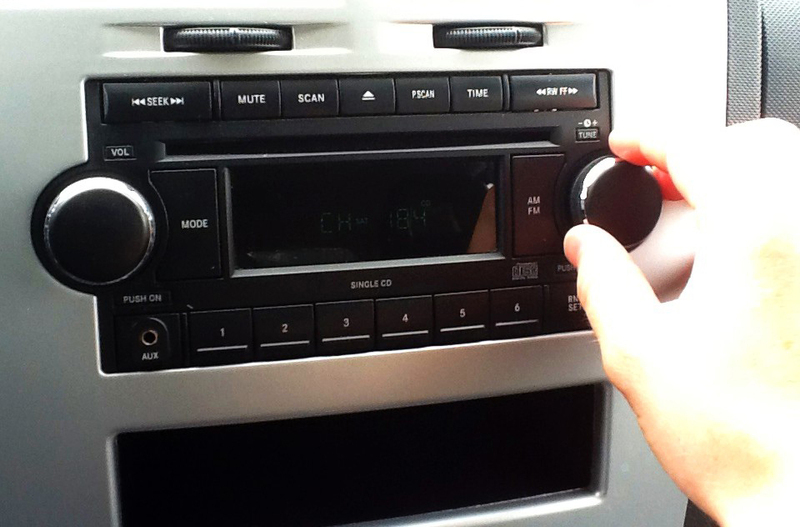 The percentage of people who’ve listened to Internet radio by connecting a mobile device to the car stereo has experienced a 50 percent increase in the past 12 months, reaching 17 percent, according to Arbitron and Edison Research. More than half of users between 18 and 24 years old have listened to an iPod or mp3 player in the car as their main source of music. One in five is streaming Pandora, according to a separate study by Arbitron and Edison Research. In-car listening is the biggest area of potential growth for Internet radio services. In the next five years, Internet radio will gain more ground in the car. It’s only a matter of time before the technology hits the streets and moves along the adoption curve. Like television and newspapers, radio is evolving by adapting to shifts in the way we live – and listen. The consumer’s desire for personalized media is driving the shift. We’re responsible for the changes that are occurring. It’s happening because we asked for it. Companies like Pandora and Spotify exist because they noticed it before the others, maybe even before we noticed it. Consumers told them what they wanted; and they were listening. They responded with services that are transforming the radio landscape. “Mobile connectivity has allowed us to deliver on our mission of providing people with music they love…” said Pandora President and Chief Executive Officer Joe Kennedy. Mobile is looking like Web 3.0 with the emergence of mobile devices like the iPad, Kindle and Nook; the rise in smartphone usage; and the explosion of mobile apps. It’s not just for work. Mobile is taking over our lives. Work and play. We’ve compiled the Top Five tools for Mobile Productivity, from the workplace to strictly entertainment. Standalone Cloud storage services like Dropbox receive most of the press. But Amazon’s variety comes with a music store. Amazon is also a great place to store your music. Music purchases from the Amazon mp3 store can be saved directly to your cloud. And thus can be accessed anywhere and with a growing number of devices including smartphones and tablets. Start off with 5 GB of free storage. Just sign in, sign up for your free 5 GB and start uploading files for backup, storage or to listen to your tunes without taking up space on your mobile device. Hundreds of companies trust Amazon Web Services for their storage and hosting needs, including Netflix — which accounts for 25% of US Internet traffic — Yelp, Foursquare, PBS, Washington Post, Razorfish, SEGA, Urbanspoon, Tweet Deck, Airbnb, Harvard Medical School, NASA, Virgin Atlantic and more. It’s time to move on from Outlook, people. Google is the place to be. When I use Outlook for email or the calendar, it feels like I’m navigating a rotary phone…plus it’s tied to a machine. Google Calendar and Docs, as well as gmail, is tied to nothing; it’s all on the cloud. Access all of it on any computer, any smartphone, tablet or mobile device. Get calendar reminders on your smartphone. With Google Apps (formerly Google Docs) user can save Documents, open Office products like Word and Excel — with or without Microsoft Office. When you save documents in the cloud — like resumes, presentations, pictures — they’re always with you. Google’s smartphone apps — and native integration with most mobile devices — make all of your documents, calendar appointments and messages accessible anywhere with an Internet connection. Save documents, presentations or pictures as a backup or for instant access on any of your devices. To get started, just sign up for gmail and click “Documents” at the top. [Note: if by the time of this post, Google has changed its navigation bar to a drop-down menu, just click the drop-down and find Documents.] Then start uploading files or Create a new document. MyFax makes having a fax machine unnecessary. In fact, MyFax improves upon the old-school fax and then some. No download necessary, just sign up for a MyFax account and you’ll be assigned a MyFax number. (You can pick the area code.) Once you’ve signed in, just click “Send a Fax.” Then enter the recipient’s fax number and attach the document you’d like to fax. Either scan the page to your computer and attach to the MyFax interface OR if the file is already on your computer, just attach. MyFax comes with some cool features including Cover Page Style; Status Flag for Urgent, Review, Comment, etc; and a Message Box. The recipient receives the fax in his/her fax machine, just like a normal fax. Receive faxes right in your MyFax inbox as PDF or JPEG files. MyFax alerts you immediately via email. In fact, you can view the fax in your email inbox. If you’ve got email on your smartphone, you can view the fax right there. MyFax is a must for mobile work. Send 100 faxes per month and receive 200 for only $10. Other options include Send 200, Receive 200 for $20. Or Send 400, Receive 400 for $40. Or an unlisted option of Send 50, Receive 50 for $5 per month. The plans can be changed at any time, though you’ll have to call MyFax to do it. Ironically, for an online fax service, you can’t change plans online. Though email is taking over, many businesses still fax documents. So ditch the fax machine and extra phone line and give MyFax a look. Netflix is the best thing to come to TV since color. It’s move to mobile only strengthens its hold on streaming movies and television content. And once you’ve got a Netflix subscription, it’s free on an unlimited number of devices. Use your one Netflix subscription on TVs, tablets, smartphones, etc. At home and on the road. Until you’ve streamed Netflix content on a mobile device, it’s difficult to understand. A library of more than 20,000 titles available instantly with the tap of your finger. It’s as close to a dream as you’ll get. To get started, just sign up for Netflix (streaming subscription starts at $7.99 per month after 1-month free trial) and download the Netflix app for your smartphone or mobile device. You’ll only have to sign in the first time after you download the app. From there on out it’s blue skies and smooth streaming. Netflix is available on more than 700 devices including PCs; Macs; Internet-connected TVs; video-game consoles; Blu-ray players; Internet video players like Roku and Boxee; iPhone; iPad; Apple TV as well as Android and Windows devices…and more. This is a great time to be a consumer. Companies are battling to release the next greatest advancement in technology — whether it’s NFC, Cloud Storage, Streaming Video or even Social Networking — and the consumers are ready and waiting. The instant a company releases a new product or service, the competition follows suit. And that makes today’s consumer more connected than ever. Brand extensions are to blame for much of the competition in technology today. Foursquare brings about Facebook Places. Skype leads to Google Hangouts. Square brings mobile payment to the forefront, with PayPal and Google following closely behind. Facebook (and MySpace before that) brought the rise of the social network; Google is now employing a brand extension with Google+. A Brand Extension is when a company known for a particular good/service attempts to extend its services to another business category beyond its initial range. Facebook has been king of the social networking world since it overtook MySpace in 2008. MySpace was recently sold to Specific Media and entertainment artist Justin Timberlake. It’s future is still uncertain. In the limited beta release of Google+, Google goes head to head with Facebook. A similar scenario to its battle with MySpace, only Google+ seems better equipped. Google+ invites are on the streets as the company seems to be opening up its social network to more users. It’s limited beta at first offered only short windows for invites from current users. The service already is reported to have users in the millions, after a little more than one week on the market. Facebook, meanwhile, recently confirmed it has acquired 750 million users. Mobile payments are a hot topic, and the most popular service is likely Square, which hit $1 million in processed payments after less than a year in business. Square was launched by Twitter co-founder Jack Dorsey in May of 2010. Google unveiled its Google Wallet offering, a partnership with Citi, MasterCard, First Data, and Sprint. Google Wallet is an Android app that makes your phone your wallet. It accomplishes this by storing virtual versions of your plastic cards on your smartphone. Using Near-Field Technology (NFC), users will be able to pay via their Google-Wallet equipped smartphones simply by tapping the phone on a checkout reader, available at many merchant locations. And most recently, PayPal bolstered its mobile offering on July 7 with the $240 million acquisition of mobile-payment service Zong. Zong partners with hundreds of mobile phone carriers around the world and allows users to enter their mobile phone number to make purchases. The charges are then applied to the user’s monthly mobile-phone bill. Zong was eBay’s second mobile acquisition. The first was Fig Card, a Square-like device that allows users to accept payments with credit cards by swiping them through Fig’s USB-powered reader. Location-based applications allow users to ‘check-in’ via smartphone and share their location with other users of the service or other social networks. Users are able to see who else is checked in at a given location (from all users) or friends in nearby locations. By checking in, users receive points and/or badges and can unlock certain specials determined by the retailer. The most publicized of these location-based apps is Foursquare. Today, there are a reported 8 million Foursquare users, up from just one million a year ago. With the introduction of Facebook Places and other location-based services like Whrrl, which was acquired by daily deals service Groupon in mid-April, companies are copying Foursquare’s model. And vice versa, as evidenced by Foursquare’s recent inclusion and emphasis on its Yelp-like service directory Explore. Brand extensions are on display everywhere we look. In June, Fast Company took a closer look at Foursquare vs. Facebook Places. With Google+, the company introduced Hangouts, a video-calling service. One week later, Facebook announced a partnership with Skype, allowing users to make video calls over the social network. The biggest advantage with Facebook Video Calling has when compared to Skype is that users don’t have to sign-up and login to Skype to chat; they simply do so through Facebook. Google+ Hangouts allows group video chats with up to 10 participants, a sort of live chat room among your friends. As you can see at the bottom of the chat window (above), YouTube is also accessible via Hangouts. I haven’t really discovered how YouTube can be used inside Hangouts. But I did watch Cake’s The Distance. I guess if my friends were on there we could have all watched it together…and then checked all of our reactions? 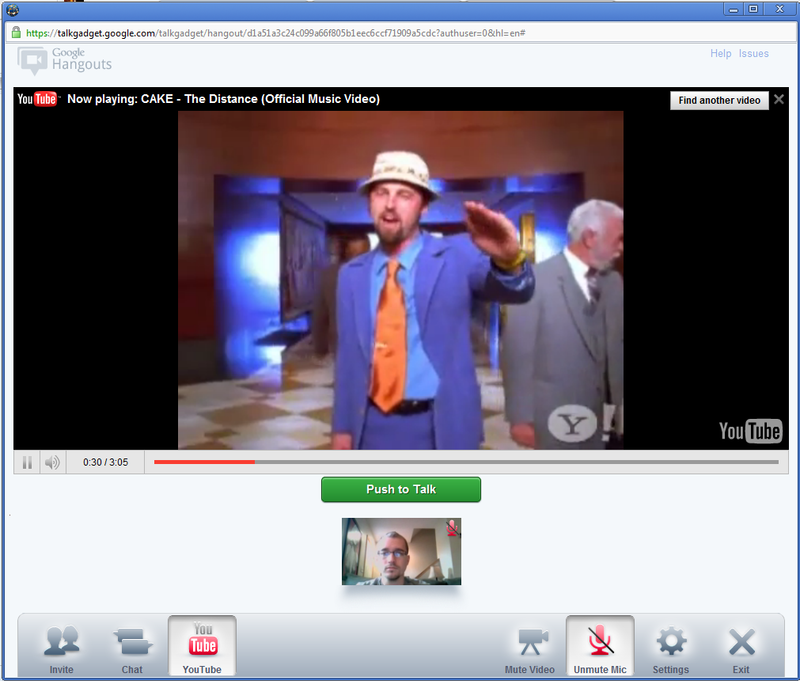 Google+ Hangouts and YouTube might be useful for work-related presentations. This service encroaches on GoToMeeting‘s territory. Now I’ve just got to find some people who want to have a meeting about Cake. On the Cloud, users can store music, videos, photos, and documents, which are then accessible from any computer or device with an internet connection and access to the cloud. Amazon starts users off with a free 5GB of storage space. The 5GB of free space is about enough space, Amazon says, to store 1,000 songs. This first tier is free and you’ll never be charged for it. If a user purchases a digital album from Amazon’s mp3 store (amazon.com), it’ll upgrade your 5GB of free storage to 20GB. 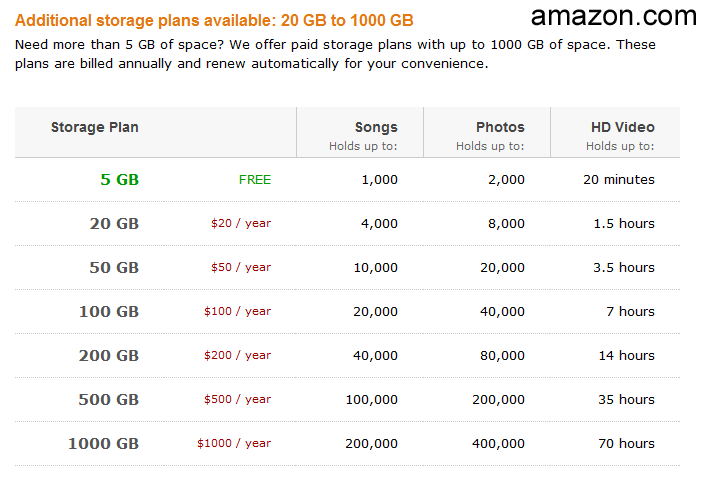 Other pricing/storage options for the Amazon Cloud range from 20GB to 1,000GB of space. Apple iCloud operates in the same way as the Amazon Cloud Player, with iTunes integrated into iCloud. Everything purchased on iTunes is automatically accessible on the iCloud, in addition to other apps, photos, books and documents. Some companies like Amazon and Apple have tied their digital music services directly to Cloud Storage. Others like Slacker and Pandora are offering a more entertainment-centered approach. Pandora makes things easy for listeners: subscription free and on nearly every device you own. Pandora got its start on the computer. But the company is making even bigger leaps away from its traditional home on the PC; Pandora is now available on smartphones, tablets, televisions and a select number of automobiles. According to a published report from Advertising Age, more than 50 percent of Pandora listening accomplished on devices other than the PC. Slacker, however, is beginning to outshine Pandora in both integration and subscription options. Slacker offers three ways to listen. The first tier, like Pandora, is free of charge (but with ads) and allows users to create a custom station based on a particular band or song. The second is a paid subscription plan that provides unlimited song skips and is ad-free; Slacker Radio Plus is $3.99 per month. Slacker also has a partnership with ABC News, with news breaks at the top of each hour for subscribers of either Slacker Plus or Slacker Premium Radio. Slacker’s newest subscription is called Slacker Premium Radio. At $9.99 per month, this service includes everything available in Slacker Radio Plus as well as on-demand music, allowing listeners to search for and play songs on-demand, or songs from a particular artist. Slacker Premium Radio encroaches on MOG’s and Rdio’s territory — a brand-extension of sorts — by offering on-demand music. It’s an exciting time for both consumers and businesses. Each service is experiencing tremendous competition — which only fuels innovation — as companies vie for the consumers’ time, interest and money. The customers ultimately decide which products succeed and which ones flop. Therefore the success of these businesses relies much on us, the consumers, and in our experiences with these products and brands and how seamlessly we can integrate them into our lives. The best technology becomes second-nature, like a brand extension of ourselves. Source: PC Magazine, cbsradio.com, siriusxm.com, pandora.com, slacker.com, usatoday.com, cnet.com, radioink.com, Ando Media, Mashable.com, Mediapost.com, TechCrunch, Tech Crunch TVFast Company, Mashable, Techmeme, CNet, ReadWriteWeb, GigaOm, Engadget, CNN Money, MacWorld, AdAge, All Things Digital, The Next Web, Foursquare, Google, Facebook, Pandora, Slacker, Square, Paypal, Amazon. Just when I understood the difference between Cumulus, Stratus and Cirrus, everyone’s talking about this new Internet Cloud. The Cloud has been receiving a lot of buzz lately. But in fact, the Cloud (or cloud computing) is really just a metaphor for the Internet — and personal storage on a network. So it’s not exactly new. In a sense, our email operates on a Cloud. If you’ve ever logged into your email from more than one location, or stored email messages in a folder for viewing later, you’ve accomplished the same thing. There’s also a distinction between Public and a Private Clouds, as well as hybrids, which I have yet to wrap my head around. That’s why we’re sticking to Public Cloud talk in this post. If anyone’s an expert in this Cloud bu’ness (particularly public vs. private or hybrid clouds), feel free to shoot me an email at ericsadblog@gmail.com and set me straight. Nevertheless, the press surrounding it has certainly exploded within the last year. As well as the number of companies developing their own cloud services for the public. Namely, Amazon, Google and most recently Apple. The Cloud is like a hard drive in the sky, allowing users to store files on a computer network accessible on-demand from any device with an Internet connection. Versus storing documents on a local computer, and thus only accessible from that specific computer. Users can upload their own music to the Cloud, in addition to documents, photos, videos, etc, in addition to use as a backup service. Or as with Amazon and soon Apple via iTunes, users can purchase music online and save it directly to the Cloud. The only limitation with the Cloud is that an Internet Connection is required to access it; though files can be saved from the Cloud to a local device (computer, smartphone, tablet, etc) for offline access. But I suppose that’s the same as saying you can only make calls on your cell phone where you have service. That hasn’t exactly stopped adoption of mobile phones. Clouds come in different shapes and sizes (both real clouds and Internet Clouds). Most companies are offering a free amount of storage space to start (for example, Amazon offers 5GB free) with premium-priced storage upgrades. Amazon, Google and Apple are entering a heated battle over Cloud services. All three of which are putting emphasis on music storage with the Amazon Cloud Player, Google Music Beta and Apple’s iCloud, which will reportedly feature streaming music and integration with iTunes. Amazon’s cloud drive starts you off with 5GB of storage space for free with additional premium plans from $20 to $1,000 per year, billed annually. Users can store “music, videos, photos, and documents on Amazon’s secure servers.” The 5GB of free space is about enough space, Amazon says, to store 1,000 songs. This first tier is free and you’ll never be charged for it. If a user purchases a digital album from Amazon’s mp3 store (amazon.com), it’ll upgrade your 5GB of free storage to 20GB. Though after one year, if not renewed, users will be bumped down to the free 5GB. It’s not an automatic renewal, so that’s nice in my opinion. We’ve all taken advantage of free offers and forgotten about them, only to be charged for something we didn’t really want. Google has taken a slightly different approach to the Cloud, offering a sleek line of Cloud Apps for different purposes. And Google’s been at this a while. I’m sure most of us are familiar with at a least a few of its Cloud Apps, whether or not we knew that’s what they were called. Google’s Cloud Apps include Gmail, Google Calendar, Google Docs, Google Chrome, Google Groups, among others. In May, Google introduced Google Music Beta, a Cloud storage service for your music, similar to Amazon’s Cloud Player. Google, however, provides quite an impressive amount of storage in the Beta version, enough for 20,000 songs according to ZDNet. Amazon’s free 5GB allows around 1,000 songs. Google Music Beta is available in the U.S. by invitation only and free for a limited time, according to the landing page in the Android Market. The last of the three to introduce a Cloud music service, Apple may have been waiting for a reason. Reports have it that Apple has deals with Warner Music, Sony Music Entertainment and EMI Group to stream songs directly to the iCloud, like Pandora, Slacker, Rdio and other streaming services. It’s rumored that the service will start with a free trial for iTunes customers, followed by a $25 per-year rate. ZDNet‘s Larry Dignan says Apple will also look to sell advertising around the cloud service. Apple currently offers a Cloud service called MobileMe, a subscription-based collection of Internet services for Mac OS X, Windows, iPad,iPhone, and iPod Touch. Apple’s iCloud all but ensures the next round of iPods will be able to connect to Wi-Fi or a 3G network. Expect more on iCloud tomorrow after Apple’s WWDC. If Apple’s iCloud introduces what everyone is reporting — streaming music — this isn’t just a battle between Amazon, Google and Apple but also Nicolas Cage Pandora, Slacker, Rdio and other music streaming services. According to San Francisco’s International Business Times, Apple has also been in talks with the film industry, possibly adding movies and video to iCould. Could Apple be looking to face off against Netflix as well? They’ve already invested in video streaming with Apple TV, though the service only includes a small line of Internet apps and pay-per-view titles, no content deals with film studios. If Apple reaches a deal with the film industry for iCloud, you can bet those titles are coming to Apple TV as well. Amazon and Apple have a clear advantage in that users can purchase music from either Amazon.com or iTunes and have it saved directly to the respective Cloud. Apple’s support from major record labels could push it to the front of the pack. The increase to 20GB lasts for one year. But, once that free trial runs out, I’ll probably be so used to using it that I’ll have to renew. (After all, it’s only $20 per year.) That is, unless I’m swayed by Apple’s iCloud offering. The Amazon Cloud allows you to store music, documents, pictures or video. I have a number of files saved for backup or if I need a document when I’m on the road. But I’ve mostly been using Amazon’s Cloud for its Cloud Player. Amazon Cloud Player – When I’m at the gym or in my car, the Cloud Player is great, with access to all of my songs and without taking up space on my phone. I’ve also been taking advantage of Google Docs. I reinstalled my operating system on my Dell XPS M1530 a while back, and haven’t gotten around to installing Microsoft Office. But with Google Docs, I haven’t really needed it. What’s next for the Cloud? In our increasingly mobile lifestyles, the Cloud is just what we need. And at just the right time. We’re all part of this mobile shift. A shift in the way we work, live, play, communicate and collaborate. Laptops, Smartphones, Tablets, Netbooks, and entertainment services like Netflix, Hulu, Pandora, Slacker as well as mobile payments like Google Wallet, and NFC technology. Mobile is taking over the news and our lives. The Cloud is the next logical step in connecting our mobile devices to all of our files, music and video. Today, home is wherever we are. Office productivity and entertainment can happen anywhere. I suppose that’s both good and bad. Luckily, if we choose to use it, there’s an off switch. I worked in the radio industry from 2008 through 2011. In that time, I had my finger on the pulse of both traditional radio as well as new radio offerings both online and via satellite. Current trends are only the beginning. The radio of the future will blow it all out of the water. Since my time in radio, I have continued to follow radio trends in both traditional listening on the dial, online radio like Pandora and Slacker as well as satellite radio service SiriusXM. Like all other media, radio is evolving. But there are still needs that these new radio services — even Pandora — aren’t fulfilling. This week, I thought I’d revisit the radio landscape and project on what radio might look like tomorrow. Local, terrestrial, radio is still dominant as far as listening is concerned, reaching 93% of Americans age 12+ each week, about 241 million weekly listeners. Online services like Pandora and Slacker are attracting a fair amount of listeners — but lack one thing that make terrestrial radio successful: ubiquitous in-car access. According to recent data, nearly 70% of radio listening is done in-car, according to research company GFK MRI. That’s a glaring need that Pandora and Slacker aren’t yet fulfilling. Until Internet radio services like Pandora and Slacker enter the automobile, they will lag far behind terrestrial radio. Sirius and XM merged in 2008. Soon thereafter the company introduced its new logo. SiriusXM Radio has also capitalized on the in-car experience, though a subscription to SiriusXM is required. SiriusXM hit 20 million subscribers near the end of 2010. Still a small percentage compared to terrestrial listeners and behind even Pandora and Slacker according to reports. SiriusXM also offers SiriusXM Internet Radio, for an additional fee to all satellite radio subscribers. At first, the online catalogue included only select channels. When SiriusXM introduced a new channel lineup this month, SiriusXM Internet Radio made available all of the channels of the satellite variety plus a few Internet-exclusive channels. Could a separate, standalone, online-only subscription model help SiriusXM build its user base? Another element to the success of terrestrial radio and SiriusXM is its live and local content. Something SiriusXM certainly recognizes. All of its music channels feature live hosts. And they’ve shown interest in adding localized content with Weather and Traffic channels. It’s something they seem to be interested in developing further. In fact, SiriusXM recently added three local ESPN Radio shows. According to Marcus Vanderberg of Media Bistro, SiriusXm will pick up ESPN New York’s Mike Lupica Show and Michael Kay Show along with ESPN Chicago’s Waddle and Silvy. “Whether it’s the Bulls’ run through the playoffs, Yankees and Mets baseball, or another local team making headlines, there is a constant sports buzz in these two cities,” Steve Cohen, SiriusXM’s SVP of Sports Programming, was quoted on MediaBistro.com. “That makes for excellent sports talk, and we’re thrilled to be able to offer these great shows to all of our listeners, allowing them to follow the local story lines all year long,” Cohen said. UPDATE: Before posting, I learned that SiriusXM has now made available a separate, standalone SiriusXM Internet Radio Subscription for $12.95 per month. A subscription to the satellite radio service is no longer required for SiriusXM Internet Radio. Per SiriusXM, users can listen on PC, Mac or smartphone “with apps available for iPhone, iPad, iPod Touch, and compatible Blackberries and Android devices.” I’m not exactly sure when this standalone subscription was introduced but this was the first I noticed it. This is important for two reasons: 1) a Sirius/XM compatible radio is no longer required for the service; 2) When 3G (or 4G) enters the automobile, Sirius/XM will be well equipped. Last week, Slacker introduced Slacker Premium Radio in an effort to break new ground — becoming more than just a Pandora alternative — giving more choice and personalization to the listener. “The new radio should be able to give people more control of what they have,” Slacker CEO Jim Cady was quoted in Radio Ink. Slacker Premium Radio offers songs, albums or artists on-demand. Now Slacker is not only competing with Pandora but also services like Rdio, which offer large, on-demand music libraries with a paid subscription. Search for an artist/band and hear all available content on-demand. In addition to Slacker’s free radio, like Pandora, Slacker offers ad-free streaming of both personalized and genre-specific channels (like terrestrial radio stations). To likely differentiate itself from Pandora and move in on the ground of terrestrial radio and SiriusXM, Slacker introduced ABC News to its Slacker Plus subscription. ABC News is also available in its Premium plan. According to Slacker CEO Jim Cady, Slacker now has 26 million listeners and 8.5 million songs in its library. Pandora had reported some 60 million listeners in the latter half of 2010, a figure that Slacker CEO Jim Cady laughed off. It’s not clear how either company is tracking or counting its listeners. iheartradio a collection of 750+ local radio stations online from more than 150 cities. Pandora and Slacker will lead the way, forcing automobiles to incorporate Internet Radio capabilities in vehicles via 3G connection. Opening up our vehicles to 3G and Internet Radio will not only benefit services like Pandora, Slacker and possibly SiriusXM Internet Radio but also local traditional radio, as it is becoming the norm for terrestrial stations to offer Internet streaming. As you can see from the radio options above — from traditional radio to Pandora, Slacker, SiriusXM and on-demand services like Rdio — the options for listeners today are plenty. Tomorrow they’ll be even greater. So we’ll need an in-car solution that can handle all that ear-poppin’ goodness. In my opinion, car tech is getting ahead of itself a little bit with what some are calling Infotainment Systems, or complete, connected car dashboards displaying as much information and entertainment as some home entertainment setups. Some Infotainment systems are well done, others are just overkill. The adoption curve is steep enough. But companies are moving forward with Infotainment Systems in vehicles, some with 3G connections. I tend to believe we should keep it simple and cost effective to increase the number of drivers who have access to these units. Not everyone will see a need for these or, even if they do, be able to afford some of them. Here are a few companies that are getting it right by focusing more on the music and less on a computer in your car. I started a mock-up of the perfect in-car unit — focusing on enhanced music offerings via 3G connection with terrestrial radio, HD Radio, SiriusXM, Pandora, Slacker, Auxillary input and USB — Until I saw what some leading companies are up to. Then I figured I’d put their work on display. Unlike some complete, Infotainment units, these appear to be more simplistic and accessible to the masses. There’s another reason terrestrial radio is still the most-used audio plaltform: it’s intuitive; and built-in. Microsoft created a pretty slick unit with Kia. 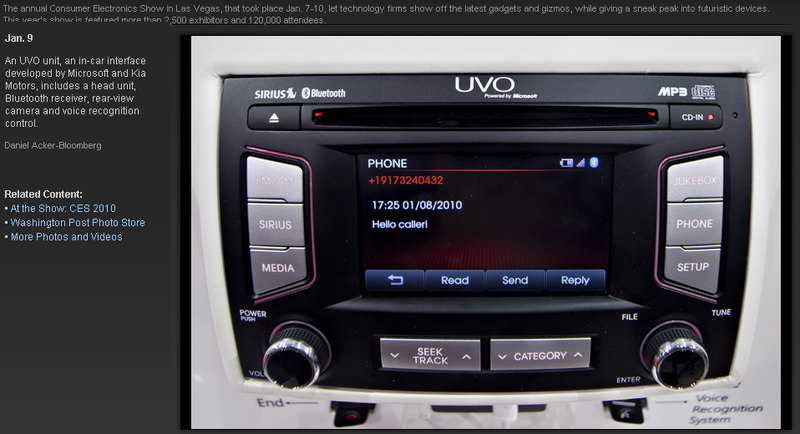 The UVO by Microsoft and Kia, first introduced at the 2010 CES. However, the UVO had no inclusion for Pandora or Slacker. At least in its initial launch. Also introduced at the 2010 CES was MyFord Touch by Ford. Which includes Internet connectivity and Internet radio, specifically Pandora. Not to be outdone, Toyota has developed a unit that syncs a smartphone with the car dashboard, connecting to the 3G network through the phone. The Toyota Entune. The future for radio is as bright as ever with new services like Pandora and Slacker adding personalization and innovation to an already exciting industry. Watch for our favorite services to offer more choices and content in the coming year; and get ready for Internet Radio in your car via 3G. Because that’s when Pandora and Slacker will truly shine, for it’s where we spend much of our radio time and — from an advertiser’s standpoint — where we are most receptive. Internet radio services like Pandora and Slacker radio are building momentum, following in the footsteps of conventional radio by offering subscription-free radio supported by advertising. But don’t let all that buzz fool you. Though the Internet radio services are getting the press, conventional radio is alive and well — still the most used audio platform among consumers. Because there’s one thing that’s holding Pandora, Slacker and streaming radio back: in-car listening. Terrestrial radio will continue to rule the air until 3G or 4G access is the norm in automobiles. Let’s take a look at the numbers. Pandora clocks in at a reported 60 million listeners at the end of 2010. Sirius XM, 20 million. Conventional radio? Each week in 2010, an average of 241.6 million people listened to conventional radio. So that’s 60 million for Pandora, 20 million for Sirius XM. 80 million to 241 million. Let’s even add Slacker’s 10 million, reported at the end of 2009. So that makes it 90 million combines listeners among Sirius XM, Pandora and Slacker to 241 for conventional radio. Like all media, conventional radio must evolve. And it is, by moving its signal online. Streaming an AM/FM radio signal is becoming a must for traditional radio stations. The future of local radio, I believe, is online. And streaming over-the-air broadcasts is the logical bridge to that point. Pandora is crushing the internet radio competition. A reported 60 million listeners at the end of 2010. Ando Media recently released its Internet Audio ranker for January, which lists the top-20-performing Internet radio stations. Pandora came out on top, with more than 643,000 listener sessions for the month of January. Next in line was CBS Radio with just over 161,000. CBS Radio’s network is nearly 200 stations covering news, sports, talk, rock, pop, oldies, and adult contemporary, many of which are streaming AM/FM stations. Slacker ranked No. 5 out of the top 20, with just under 36,000 average active sessions in January. Average time spent listening per session for internet radio, however, comes in below its conventional radio counterpart. Most likely because of the means of distribution: the Internet. Whereas AM/FM radios are nearly ubiquitous, Internet-radio devices are rolling out but still missing a vast majority of the automobile industry, where much of radio listening takes place. Pandora clocked in at an average time spent listening for each session of .85 hours. CBS Radio at .90 hours. Bonneville Corporate had the highest average time spent listening, coming in at 3.42 hours. Conventional radio average time spent listening per session is roughly 3 hours during the weekday and 5 hours for each session over the weekend. As in-car units become more readily available and a factory standard, watch for average time spent listing to increase substantially for Internet radio. Pandora got its start on the computer. But the company is making even bigger leaps away from its traditional home on the PC. Pandora is now available on smartphones, tablets, televisions and a select number of automobiles. Pandora offers two ways to listen, as well as a third ad-supported brand radio. Create your station: select artists you like and Pandora will choose songs it thinks you’ll enjoy based on your interests. Genre stations, pick your format: very similar to conventional radio, with a different format for each station including rock, pop, R&B, hip-hop, country, etc. Brand radio. Advertisers compile a mix and a pop-up banner appears on the computer screen, with a heading along the lines of “Listen to Subway Radio,” or whatever the advertiser. Another way advertisers are blurring the lines between ads and content. Pandora does offer an ad-free option. Pandora One is $3 per month, billed $36 annually, to stream its music commercial-free. Pandora One also offers unlimited skips whereas the free version allows 12 skips per hour. “Skips” allow you to skip the current song and move on to the next. Slacker CEO Jim Cady will be a keynote speaker at radio’s digital media conference, dubbed Convergence 11, May 18 and 19 in Mountain View, Calif. Slacker is the next hot thing on the music street. Much like Pandora, Slacker offers two ways to listen: create your station or pick a music genre/format. One advantage Slacker has over Pandora, and the reason I’ve been listening to it more than Pandora, is its partnership with ABC News. I’m enjoying my 14-day free trial of ABC News in my custom station, with news breaks at the top of each hour. The company also recently announced a deal with ESPN which will give Slacker users access to ESPN Audio content including Mike and Mike In the Morning, SportsCenter, The Herd with Colin Cowherd, as well as top news stories and sporting events. Slacker also offers an ad-free subscription option. Slacker Radio Plus is $4.99 per month billed monthly or billed annually at $47.88 ($3.99 per month). Slacker Radio Plus, in addition to commercial- and banner-free listening, offers unlimited song skips, complete lyrics and ABC News breaks at the top of each hour. As well as a cache feature that allows users to, after creating a station, save the playlist for offline use. Slacker Premium Radio was introduced after Radio Plus and features even more radio goodness including lyrics, on-demand access to songs, caching and playlists. Slacker Premium Radio is $9.99 per month. Since their start in 2001, Sirius and XM Satellite radio have both required in-car or at-home units that must be purchased from SiriusXM or authorized third-party developers. Subscription rates start at $14.95 per month. Sirius Satellite radio and XM Satellite Radio completed their merger in 2008. The services still operate independently as to receive both Sirius and XM, subscribers must pay more for the “Sirius Everything Plus the Best of XM.” Otherwise you’ll get the Sirius lineup or the XM lineup, with some crossover but still different stations and sports leagues and sports/talk personalities. After the merger and since the end of 2010, Sirius XM subscribers total 20 million. Sirius XM operates on a dual revenue stream, with monthly subscriptions in addition to advertising on its News, Sports and Talk stations. Its music-only stations are commercial free. Update: After the merger, SiriusXM has introduced new pricing plans: Internet Radio, Sirius/XM Select, Sirius/XM Premier (Depending upon which radio the user has purchased). SiriusXM Internet Radio is an Internet-only subscription for $14.49 per month, with more than 130 channels streaming. No unit is required. SiriusXM Select is an in-car or at-home subscription featuring 130 channels — requiring a Sirius Radio unit — that comes in at the same price of $14.49. Sirius Premier, with 140 channels, will set you back $17.99 per month. For both in-car or at-home plans, users have the option to add SiriusXM Internet radio for an additional $3.50 per month.